South Carolina law has established suspension systems based upon the accumulation of points assessed for convictions of natural resource laws. The Game and Fish Point System applies to violations inland of the saltwater/freshwater dividing line and if suspended under this system, a person cannot hunt, fish, gather, trap, land, or pursue game, fish, crustaceans, or shellfish in the State (including coastal waters out to the three mile limit). The Saltwater Point System applies to violations within the coastal waters of the State, seaward of the saltwater/freshwater dividing line. The point categories for assessments are recreational and commercial. Points are assessed according to the appropriate category. Upon accumulation of 18 or more points in the recreational or commercial categories, a person’s privileges to fish, gather, land, attempt to take, or possess fish, shellfish, or crustaceans within the coastal waters for the purposes of the affected category will be suspended. Suspensions under the Saltwater Point System do not effect inland freshwater fishing privileges except for shad, herring, and sturgeon which are regulated by coastal laws inland of the saltwater/freshwater dividing line. Each time a person is convicted of a violation listed in the point systems, the Department must assess the points against the person's record. Half of the points on record are reduced for each full year in which the person receives no points. The Department of Natural Resources must suspend the privileges of any person who has accumulated eighteen (18) or more points. In addition to these point suspensions, South Carolina law also contains mandatory suspensions for convictions of specific violations of the law. These suspensions are called "Statutory Suspensions." See Table C for some specific examples of statutory suspensions. A person who has been notified of a suspension may appeal the suspension pursuant to the South Carolina Administrative Procedures Act. The appeal of the suspension is not an appeal of the person’s conviction. The Administrative Law Court does not have jurisdiction to review the conviction, only the suspension. Appeals must be filed and served within 30 days of the date of suspension notice. You must file the appeal with the Clerk of Court of the Administrative Law Court. South Carolina Administrative Law Court, Edgar A. Brown Building, 1205 Pendleton St., Suite 224, Columbia, SC 29201, Voice: 803-734-0550, Fax: 803-734-6400. If an individual appeals a suspension the SCDNR will temporarily end the suspension. The result is that an individual will retain the privileges that were initially suspended during the period of appeal. The period of appeal begins when the SCDNR receives notification from the Administrative Law Court that the case has been scheduled for a hearing. The SCDNR will notify the individual in writing when the period of appeal begins. Until that notice is received the suspension remains in effect. A withdraw of the appeal by the individual, or a finding in favor of the SCDNR by the Administrative Law Court will result in the individual having to serve the remainder of the suspension. A finding in favor of the individual, or a finding by the SCDNR that the suspension was in error, will result in a dismissal of the suspension. A violation of natural resources law while under suspension may result in additional suspensions of one year to five years. The purchase or procurement of a license, permit, stamp, or tag allowing suspended privileges while under suspension is a fraudulent purchase and is a misdemeanor punishable by a fine of up to $1,085.00 and an additional one year suspension of hunting and fishing privileges. Failure to pay fines and/or restitutions may result in suspension of privileges. To find out more information on suspensions, contact the SC Department of Natural Resources, Records and Intelligence Section, Law Enforcement Division, P.O. Box 167, Columbia, SC 29202 or call 803-734-3876. Taking waterfowl with lead shot. Taking fish with too many devices. Killing birds of prey (Hawks, Kites, Vultures, Kestrels, Owls, or Falcons). Taking fish while violating specific freshwater nongame fishing laws such as illegal bait on trotlines or set hooks. 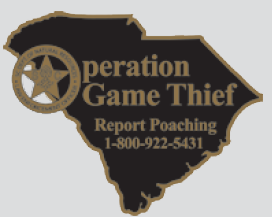 Taking game while violating specific trapping laws such as unlawful traps. Other less common examples are, but are not limited to, taking game while unlawfully hunting with an electronic call, or killing a turkey with a rifle. The application of item 34 is very broad and examples are given for clarification. Item 34 applies to unlawfully taking game or fish in a way that is not specifically addressed by the Game and Fish Point System. Saltwater points are assessed in two categories: Recreational and Commercial. Upon an accumulation of eighteen (18) or more points in a category, the privileges of that category will be suspended for one year. While under Recreational Suspension, a person found guilty of a commercial saltwater violation will have all saltwater privileges suspended for one year. While under Commercial Suspension, a person found guilty of a recreational violation will have all saltwater privileges suspended for one year. 3. Violations of a section of Title 50 pertaining to saltwater fisheries not mentioned specifically in this section. Note: It is unlawful for a person whose commercial privileges are suspended under this chapter to be on board any vessel while the vessel is being utilized to take or attempt to take saltwater fish for commercial purposes. The above listed violations are examples of statutory suspensions. Other statutory suspensions exist with time periods ranging from 10 days to 10 years for certain violations and certain privileges. Game and fish law violators steal your wildlife and rob you of tax, license, and business dollars. They cheat you out of recreation and your children out of part of their future. You’re their victim as surely as if they’d robbed your home..
You can make a contribution to Operation Game Thief. Contributions will be used to make rewards to persons providing information leading to the arrest of game and fish law violators. Contributions are tax deductible..
You can report a violator (anonymously if you choose). If your information leads to an arrest, you will receive a cash reward of up to $500.00 dollars. Rewards are dependant on the amount and type of information.